I requested an ARC of this book, even though I basically only read YA stuff, because I love Retta. I loved her low key demeanor on "Parks and Rec" and that she's a big girl. I was excited to see what she had to say in print and to learn more about her than "Treat yo'self" and I was not disappointed for the most part. The first chapter was illuminating because I had no idea she was a talented singer as well as comedian. Talented enough to be given the opportunity to audition for "Dreamgirls" which seems pretty amazing! 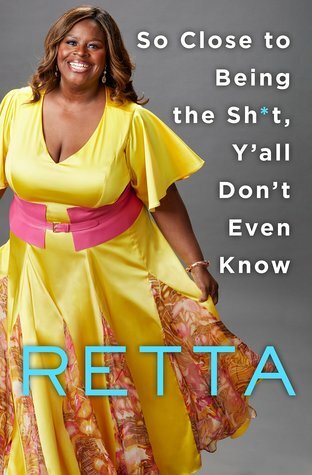 That chapter surprised me, taught me something about Retta, made me laugh, and offered some thoughtful insight into self-perception and opportunities. I wish I could say the same for the rest of the book which instead seemed to take a turn more toward stream of consciousness and fun time without as much introspection. I didn't pick up the book expecting a self-help tome or relying on Retta to tell me who I am, but I wanted more meat than was offered throughout. I'm not sure I know much more about Retta than I did going in. But for something fun and easy to read, it's a winner.